While the possibility to create a single-atom-thick two-dimensional layer from any material remains, only a few such structures have been obtained other than graphene and a monolayer of boron nitride. 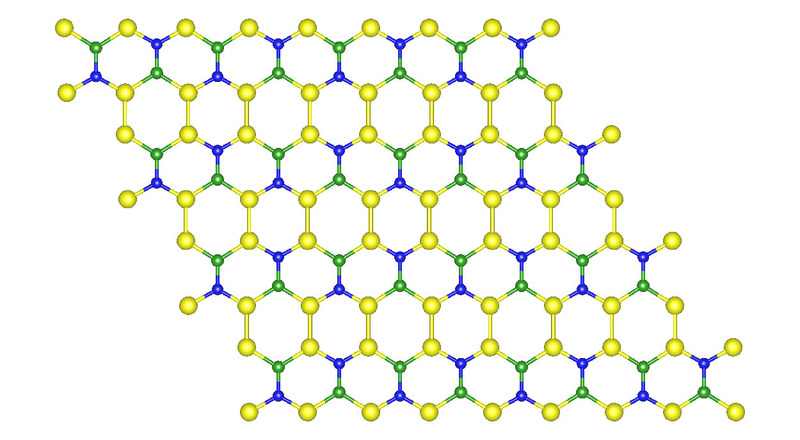 Here, based upon ab initio theoretical simulations, we propose a new stable graphenelike single-atomic-layer Si2BN structure that has all of its atoms with sp2 bonding with no out-of-plane buckling. The structure is found to be metallic with a finite density of states at the Fermi level. This structure can be rolled into nanotubes in a manner similar to graphene. Combining first- and second-row elements in the Periodic Table to form a one-atom-thick material that is also flat opens up the possibility for studying new physics beyond graphene. The presence of Si will make the surface more reactive and therefore a promising candidate for hydrogen storage.